* 5 minutes à pied de l'Université de l'Alberta, University Hospital, Hôpital pour enfants Stollery et le Cross Cancer Institute. * Situé tout près de la vallée de la rivière au coeur de la ville. Cette unité dispose de 3 lits queen et 2 lits doubles. Il y a un lit Queen au sous-sol dans un espace non clos. Comfortable and luxurious, but TERRIBLE parking! We stayed here for our kids’ volleyball tournament and it was very comfortable as every room had its own full en-suite. We didn’t give this 5 stars because the parking was VERY tight for 2 vehicles and the back lane to get into the garage was not only muddy and bumpy they had an open excavation which made it difficult to drive! There is a bus stop right in front of the house so you can not park on the street. The beds in the basement were very hard which made sleeping a bit uncomfortable, perhaps an upgrade in the mattresses? There is also garbage scattered near the back of the property which made it feel unkept. The house itself is amazing and clean, and we would definitely come again in hopes that the back lane is paved and tidied up. All in all we had a very comfortable and pleasant stay. Very Nice house, well equiped, check in was easy. Great layout, service, and location!!! This was our second time staying at this property. The layout is phenomenal, my wife and I had our 2 kids- each room has it's own full bath. My parents came for dinner and then stayed the night in the downstairs bedroom- so it's perfect from a versatility standpoint. 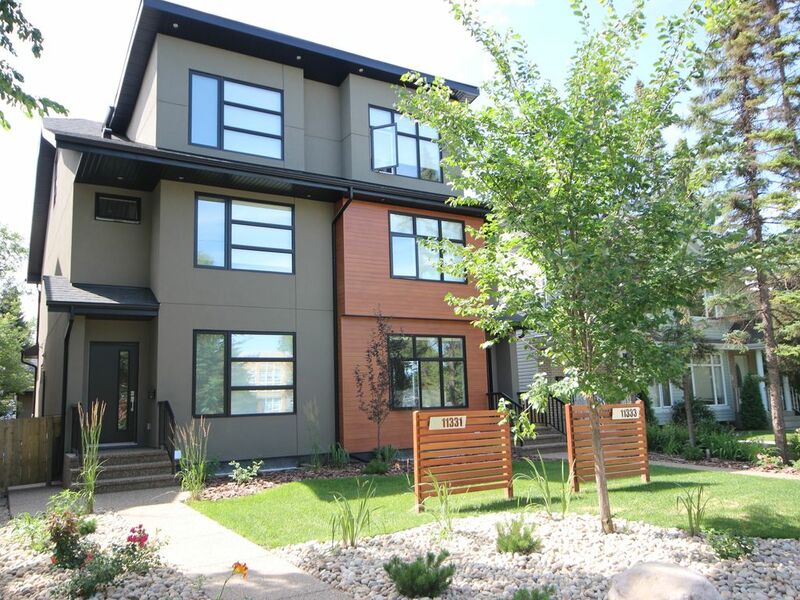 Super close to parks, LRT, roads to get to other attractions. Great service. We were even offered a portable crib for our next visit so we don't have to keep bringing our own. We plan on staying here for our future trips to Edmonton. I needed a place to house a large family and wanted one location, this worked out perfect. Many bedrooms and bathrooms made for easy and pleasing stay. The location is close to the University and that is why it was chosen. Only has one TV in the main living room area if this matters to you. The heating, or rather the cooling system seems to have a mind of its own. I think some one previously played with the programing and the temperature was very low inside as well as outside. The rest of the accommodations worked as they were suppose too. I would stay again if I needed a large house. Previous complaints of road noise ect are true, but it is a city so not really that bad. Nice place modern infill that is nicely appointed including detached garage that is on the smallish side. We could barely fit two cars in it. Very near local transport and we walked the area in the evening and felt safe. University close. Comfortable beds and sitting areas although the kitchen chairs were dated. Microwave did not work but did not impact our stay since we ate out mostly. If you are hot natured the place is very warm at 24 degrees Celsius but lots of fans available. Thank you for your feedback. AC has now been installed so this will not be an issue going forward. The place is beautiful. Spacious, updated fixtures, and a good location. We had a large group in town for 4 days for a wedding, and the house was absolutely perfect for our family. Having 4 full bathrooms was key to keeping everyone happy (and on time for the wedding festivities)! It was quite hot in Edmonton during our stay, and the house is not yet equipped with A/C, but Michael and Debbie were quick to respond and brought over extra fans to keep us comfortable. Debbie also said to me that they are working to get the A/C installed soon, so it shouldn’t be a problem moving forward! All in all, I would recommend this property to anyone coming to Edmonton. Check in: 4pm & Check out: 10am This house is in immaculate condition. NO Pets and No smoking allowed. We will have it stellar for you and we ask you leave it stellar for the next guests. This is not a party house but an executive luxury rental. IF YOU WANT TO PARTY THIS IS NOT THE PROPERTY FOR YOU. YOU WILL BE ASKED TO IMMEDIATELY LEAVE. The other unit is also occupied and they do not tolerate noise. Please be courteous of the other guests and we will ensure they are courteous for your visit. Thank you for reading this and following these rules and we are absolutely sure you will love your stay. Guests will be required to provide a copy of their credit card and corresponding photo identification to confirm their booking.